The PL:BECS investigation confirmed that the weather conditions allegedly needed to make the windows leak occurred only once in the buildings’ lifetime. 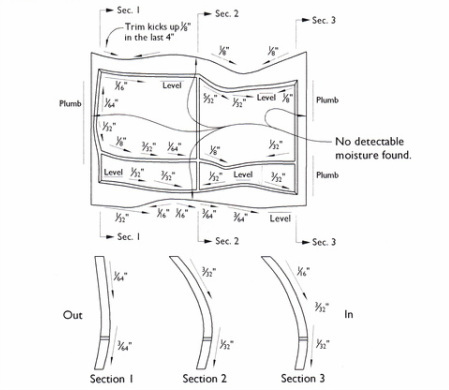 The PL:BECS investigation showed that deflection of windows resulted from structural deflection of walls containing them, rather than reflecting defective window units. Project Summary:	These were two similar and recently completed luxury condominium buildings which began experiencing extensive leakage shortly after construction. An investigative report prepared by another consulting firm placed much of the blame on defective window units, resulting in a very costly claim against the window manufacturer. PL:BECS Services:	PL:BECS was retained to provide technical consulting to the window manufacturer’s attorney. The investigation performed by PL:BECS completely negated the assertions against the window manufacturer. Deflection of the windows was shown to result from structural movement and infiltration via other elements, rather than reflecting faulty window units. Severe infiltration at some window units was shown to result from faulty roof scupper installation above these windows, rather than resulting from the window units. Post-tensioned creep of the base structures of both buildings caused other damage also erroneously attributed to faulty windows. The PL:BECS investigation was instrumental in reaching a settlement for a small fraction of the original claim.